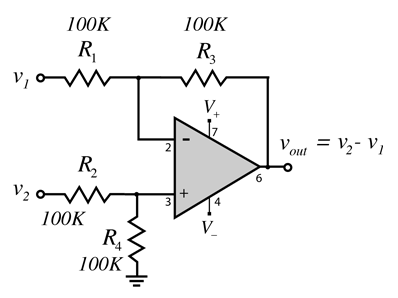 This amplifier uses both inverting and non-inverting inputs with a gain of one to produce an output equal to the difference between the inputs. It is a special case of the differential amplifier. You can also choose the resistances to amplify the difference. 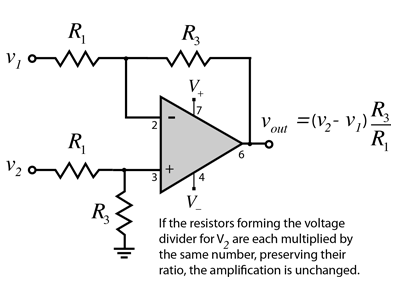 This amplifier uses both inverting and non-inverting inputs with a gain of one to produce an output equal to the difference between the inputs. It is a special case of the differential amplifier. You can choose the resistances to get an amplification of one. 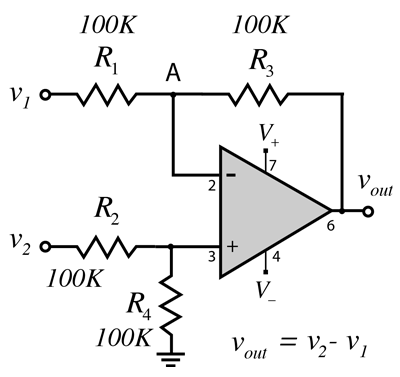 The behavior of most configurations of op-amps can be determined by applying the "golden rules". 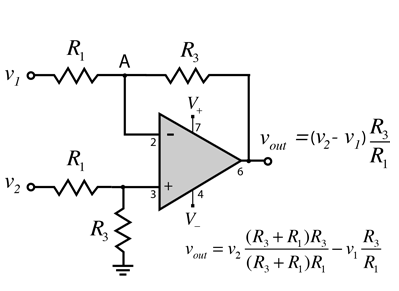 For the difference amplifier, the voltage at the non-inverting input is v2/2 , so by the voltage rule that voltage also appears at point A.
so by the voltage rule that voltage appears at A. The current rule at A gives Substitution gives the expression at right.